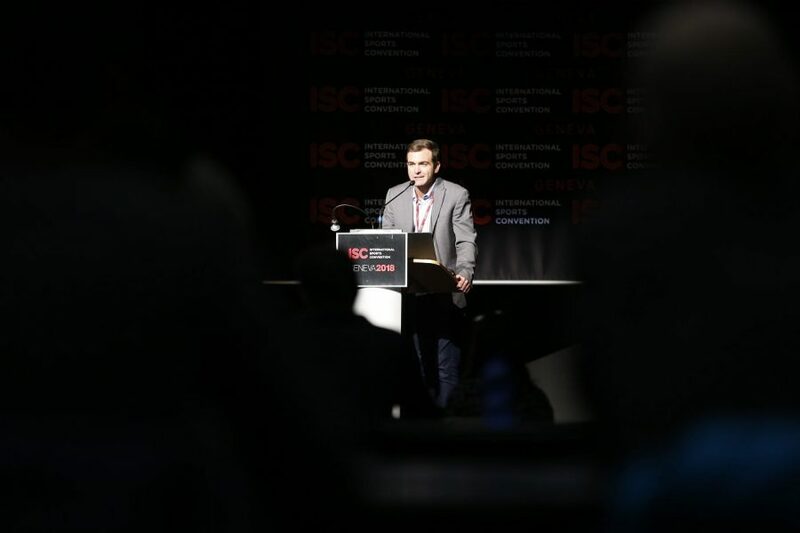 The International Sports Convention has been extremely well-attended on the opening morning of this year’s event at the Palexpo in Geneva. Charlie Enright was the third speaker in the sports sponsorship conference and he began his presentation with a short film about life aboard the ocean as a skipper on a Round-The World Yacht Race. Mr. Enright has twice competed in the 11-leg, nine-month marathon and he revealed that it was just as big a challenge to raise the 20 million dollars-worth of sponsorship in order to compete, as it was to actually sail around the globe. Over 150 attendees were engrossed as he told of his adventures in what he described as ‘the longest and toughest sports team event on the planet. Life on board a 65-foot carbon-fibre ocean racing vessel, with confined space, no amenities – and at sea for a month at a time, was enthusiastically described. The 12-person (nine men three women) crew lived on freeze-dried food and visited some of the most treacherous points on the planet. An interesting statistic was revealed by Mr. Enright in that their adventures in the Southern Ocean had them so far away from civilization that the nearest humans to them were on the International Space Station. Ultimately, according to Mr. Enright, the Round-The-World event is more than a race it is a global platform and a test of athletic endurance. The race had 12 stop-overs, with an incredible 2.5 million people visiting the race villages. Over 1.2 million people followed the event on Facebook. Mr. Enright gave a fascinating insight into many of the challenges facing the planet today, including sustainability, plastics in the ocean and the link between the environment and the sport. The advantages of being a brand sponsor for such a colossal event were clear.